3D high resolution and fully detailed model of a Anchor Handling Tug Supply Vessel. 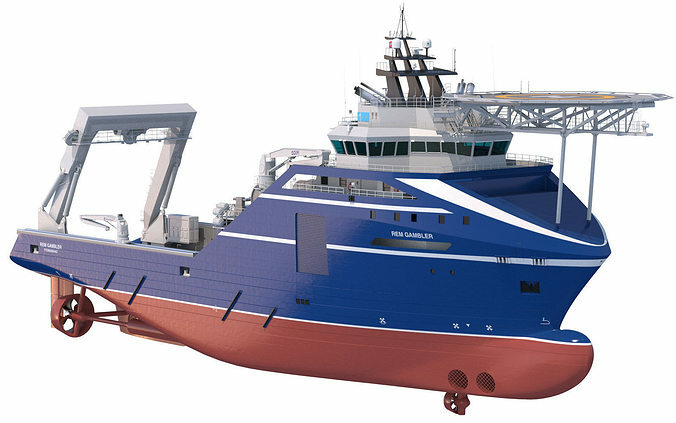 The Rem Gambler, with a bollard pull of 344t, is considered as one of the most powerful anchor handling tug supply vessels AHTS in the world. It is capable of undertaking offshore construction support OCS operations and is outfitted for underwater remotely operated vehicle manoeuvres. The vessel is equipped with one deck crane, two cargo-rail cranes with Rolls Royce manipulators and one offshore crane. Closed model, no holes or lost polygons. No double sided materials. Crystals have been modeled with volume for renderers like Arion or Maxwell. Vessel Texture map 3500 x 1134 px. Vessel Bump map 3500 x 1134 px. Container Texture map 1734 x 579 px.